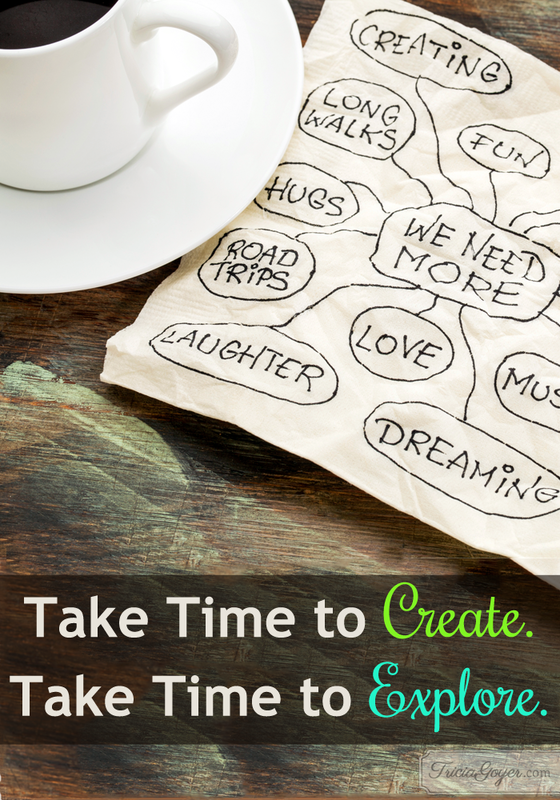 Take Time to Create. Take Time to Explore. You are here: Home / balanced / Take Time to Create. Take Time to Explore. Guilt weighed me down as if Barney the dinosaur sat on my shoulders. I thought I must have been the worst homeschooling mother ever. To combat my guilt, I swung the other way. I wanted to do everything—to make sure my kids lacked nothing. I became over-committed, making frequent library trips, getting my kids involved in every church program, and signing my daughter up for dance lessons and my boys up for sports. It was my husband who urged me to stop the madness. Sure, I was writing and my kids had very active lives, but I was running myself into the ground. Our kids even started getting stressed because they had no down time. Finding peace took me figuring out what was most important and focusing on that. Now that I’m getting the chance to homeschool again, Alyssa, I’m finding I’m more lax about things. I’m also a lot easier on myself about following my dreams and being a good mom. These priorities continue to guide my everyday living as I spend time with my writing and with my daughter . . . and Barney still playing in the background.